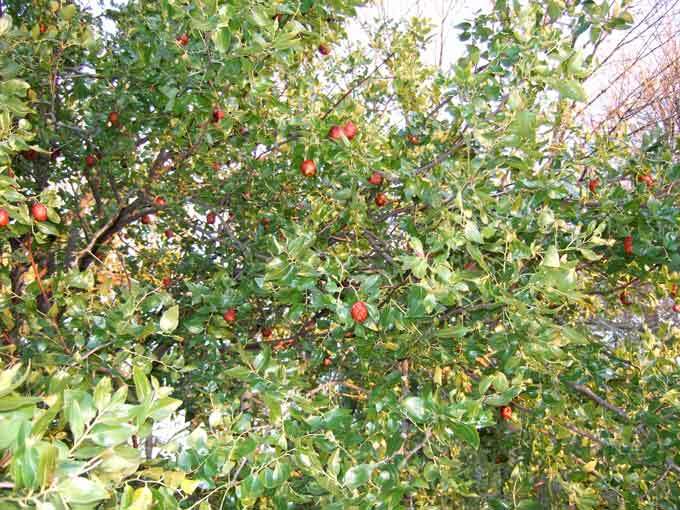 A recent article here about rare backyard fruits described my first experiences with the uncommon jujube fruit, which is also known as the Chinese Date. No, I wasn’t impressed with this odd tree fruit when I tasted it for the very first time. But despite the so-so encounter with that initial jujube fruit, I was determined to keep an open mind about the worthiness of planting a jujube tree in the backyard orchard or landscape. My optimism increased when I received a favorable jujube comment from Ben, a member of the California Rare Fruit Growers who painted a rosier picture of the jujube and suggested that the fruits which I had sampled may have been well past their prime. So I figured that I would give them a second chance but hardly expected that the opportunity would arrive as soon as it did. This past weekend while visiting a friend’s organic farm I casually noticed a container of small fruits as I walked through the breezeway. I didn’t think much of them until later that day when she mentioned her jujube tree and it finally clicked that those were the strange fruits I had noticed in the container. Well it turns out that there’s been a rare jujube tree growing right under my nose for over twenty years. I don’t know how it escaped attention in past visits and conversations but it’s been growing there all along. The fruits mature in the fall and this tree had been bearing loads of ripe fruits over the past few weeks so I quickly found myself engaged in another jujube sampling session. After biting into a couple of these freshly harvested jujubes it was obvious that I hadn’t given this unusual fruit a fair taste test. The fruits that I had eaten during my previous encounter were dry and shriveled in comparison to these. There was actually no comparison at all and I have to confess that I’ve been converted and am now a big fan of the jujube, and love the unique taste of this uncommon fruit. The jujubes were about the size of a large walnut and the flesh was crisp and apple like in texture. It tasted a little bit like an apple but I could finally understand how it came to be called a Chinese Date as there was definitely a hint of the flavor and sweetness that you get from a date’s fruit. Following my quick conversion to a jujube lover status, of course I had to go visit the tree and also check to see if there were any jujube fruits left on it. I was pointed in the general direction and off I went in search of this rare jujube tree. I had no idea what the tree would look like but it didn’t take too long to stumble upon the jujube. 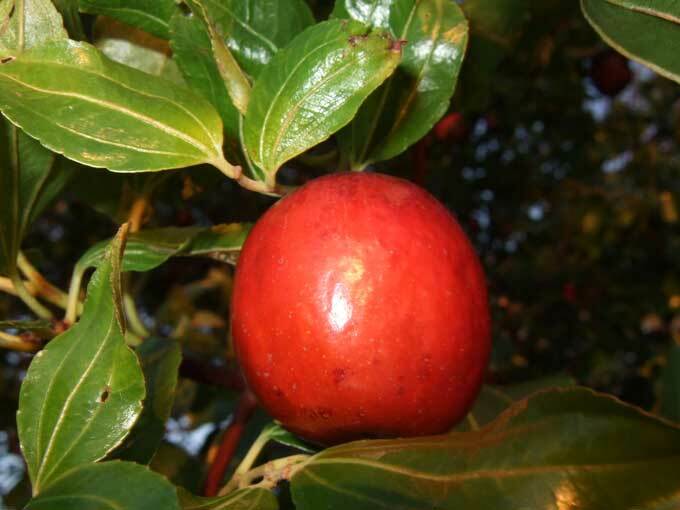 What gave it away, even in the distance, were the reddish-brown fruits that hung all over the branches of this very attractive tree. Although this was a mature jujube tree, it was no more than twenty-five feet tall and looked like it would fit well into the average backyard landscape. Judging from the fruits that were left clinging to the tree I would also say that the tree is very productive and relatively care free. This particular jujube tree has been growing on its own with absolutely no pruning, fertilizing, or insect control and it still managed to produce a bumper crop of tasty, disease and insect free fruits. 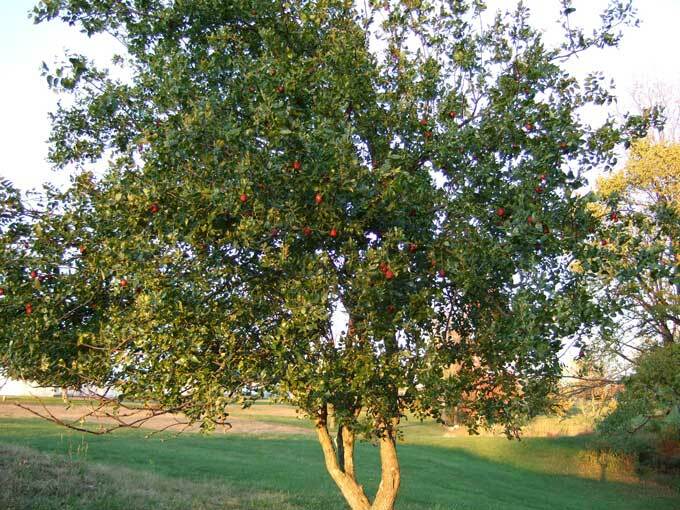 I’m very glad I kept an open mind about this one and wouldn’t hesitate to grow or recommend the inclusion of a jujube tree as a wonderful addition to the backyard orchard or ornamental edible landscape! I was pleasantly surprised to see your post about the jujube tree. I was in Southern Italy at the end of September and my friend had a large tree, with loads of fruit on it. I ate some every time I walked by it. People do say they are best when a bit wrinkled, but I don’t agree – I like them ripe, but smooth. Unfortunately, from what I’ve read they need a lot of summer heat, which they definitely would not get here in San Francisco. My friend’s mother gave me a recipe for jujube jam, involving dried figs and unshelled almonds, which I will have to wait to try when and if I find jujubes at one of our farmer’s markets. I have a jujube growing in Toledo Ohio. I would like to have a 2nd but have been unable to grow any from the “seed”. I assume that I need a 2nd tree for pollination? How can I acquire the same tree that will grow in north west Ohio? Hi Erik, I have a friend with a jujube tree that bears plenty of fruit and it is the only tree in the area so I know that at least some of the jujube varieties are self pollinating. How old is your jujube tree, maybe it just hasn’t reached maturity for fruit bearing. You’d probably get better results by trying to propagate jujubes through cuttings and grafting but I’ve never attempted to propagate one myself. The jujube (pronounced joo-joob) has been used in Chinese medicine for almost 4,000 years, making it one of the world’s oldest known fruits. Also known as the “Fruit of Immortality”. Shennanog, an ancient Chinese herbalist, was the first to record the jujube fruit’s healing properties. He described it as an almost miraculous health tonic, prescribing it to nourish the liver, spleen, and blood. He found it useful for detoxifying the body, calming the mind, treating weakness and fatigue, and giving relief from the heat. The jujube has many uses in places all over the world today, from China through the Middle East and beyond. The remarkable benefits of this fruit are now made available to you in a convenient one ounce serving along with 7 other “superfruits”, 12 vitamins and 68 minerals. I take a one ounce shot of Bazi every day. To learn more about JuJube fruit or Bazi…where the JuJube fruit is concentrated…visit: http://www.bazidrink.com. Wanted to plant two jujube trees in my yard. Was wondering if I can plant them 7 ft apart and train them or they better off natural? Evan, Jujube trees are naturally small growing but seven feet apart seems a little too close to plant them. I would probably space the Jujubes at least twenty feet apart or just put one in and allow it to reach its natural size. We have two sugar cane jujube trees. The top of the trees look dead but the bottom of the trees have plenty of shots with green leaves on them. Should the top part be taken out? Hi Joy, look dead or is dead? If you are sure that the sections are dead then yes I would prune them out. You can always wait until spring and prune the dead growth out then if they don’t show any sign of life. I was India last week and had plenty of jujube frresh fruit. I loved it as a kid and I love it even more knowing their nutritional value. How can I plant one on my backyard? thanks. I would like to give my children a gift of a jujube tree, but need to know if it will grow in their zone, They are in Southern California in Poway, which is North County area of San Diego. Please advise. They are avid gardeners, and just had a baby so this tree would be a gift to plant in honor of the birth of my granddaughter! Loved the information I have three trees growing in my orchard that make lots of fruit but other then enjoying the great fruit didn’t know to much about them, now I do, thanks. I also pick some when they are wrinkled and grind them in a meat grinder with raw almonds and make muffins out of them there great. I have an amazing jujube tree. Honestly I don’t love the fruit but I couldn’t ask for a more attractive tree.